The first trail-bike style, short chainstay, big tire hardtail is all Niner and all fun. Based on our wildly popular long travel hardtail geometry, the ROS 9 Plus delivers miles of shreddy riding. 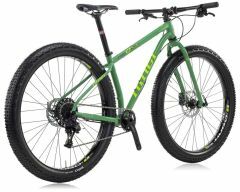 The bike features short chainstays for a playful feel (437mm at 9 o’clock BB position), while accommodating 3.0 tires for the ultimate in traction and plushness. The 29 Plus platform is the most versatile of the big-tire options – great for off season riding and a functional daily driver – and now we’ve made the most fun version of this platform available.